Today’s post will be a little different. Instead of breaking an old box, I’m busting out another vintage pack (and no, there will be no bitching about Ben Henry in this post). You may remember I busted a pack of 1978 Topps a little over a month ago. Today, I’ll go back a year and bust a pack from 1977 Topps. 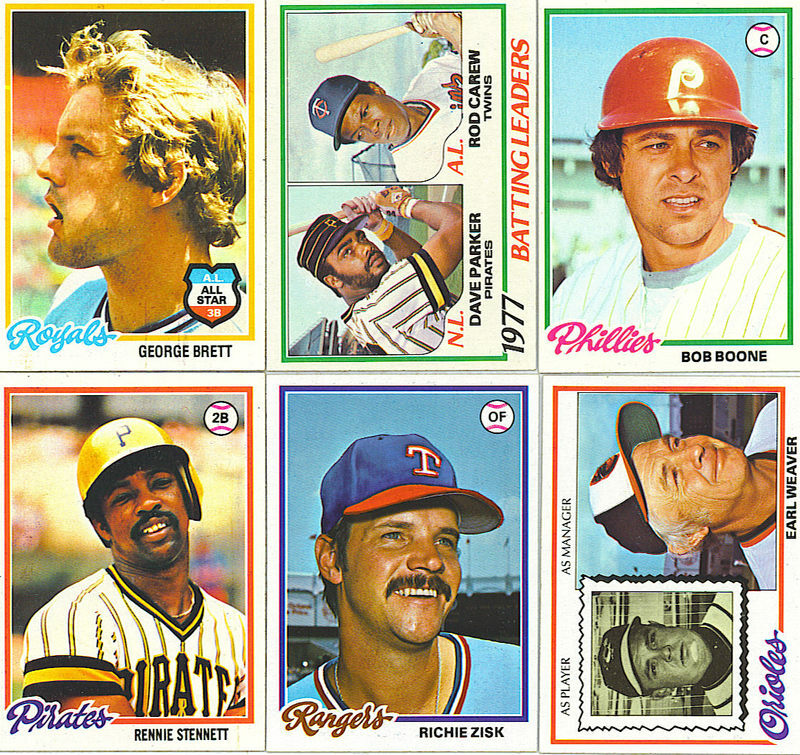 1977 Topps is a special set to me. When I was 11, my father bought me a small lot of vintage cards for my collection. At the time (1994), I was just getting into cards and often bought packs and singles of cards that were new at the time. My father acknowledged my interest in cards and decided to give my collection a kickstart. He took me to meet a man he knew from work, who hooked him up with some deals. At the end, I walked away with a lot consisting of cards, new and old. The highlights were a 1975 Hank Aaron RB, 1979 Nolan Ryan, 1977 cards of Robin Yount, Mike Schmidt, and Pete Rose, and a whole bunch of newer star cards (Mattingly, Gwynn, etc). I’ll never forget how in awe I was of those cards back then. Heck, I’m still in awe of them. With that said, this set obviously has special meaning to me. Card 1: #347 George Foster (Reds) – It’s very fitting that Mr. Foster starts off the pack. In 1977, Foster won the N.L. MVP Award after dishing out .320/52/149. Baseball would not see another 50-homer season until Cecil Fielder’s performance in 1990. Foster’s amazing season came a year after finishing runner-up in the MVP voting to teammate, Joe Morgan. The back of the card lets us know that he homered in the All-Star Game in ’76 and was voted the game’s MVP. As the top card in the pack, this was a victim of some damage thanks to the gum stain. Stain (and some slight off-centering) aside, the card looks great. Also, I see we share the same birthday (December 1), with me being 35 years his junior. Card 3: #440 Jon Matlack (Mets) – 1977 ended up being the final season in New York for Matlack. It was a disappointing season for the former Rookie of the Year as he went 7-15 with a 4.21 ERA. Card 5: #115 Rick Manning (Indians) – 1977 stats: .226/5/18 in 68 games. Card 7: #432 Buzz Capra (Dayf’s Team) – Originally a Met, Capra broke through in his first season in Atlanta, going 16-8 with a 2.28 ERA in 1974. That year, he was voted to the All-Star team, but didn’t play. In 1977, his final year in the Majors, he went 6-11 with a 5.36 ERA. If anyones cares, here’s a box score of that game. Card 10: #658 Marty Pattin (Royals) – Well, so much for ending the pack with a bang. Pattin played for four teams in his 13-year career, including the expansion Seattle Pilots. He compiled a 114-109 record as a starter and reliever and a 3.62 ERA. Final Thoughts: Well, the pack started out pretty good (CINCI-JO?!?) and quickly got very average. 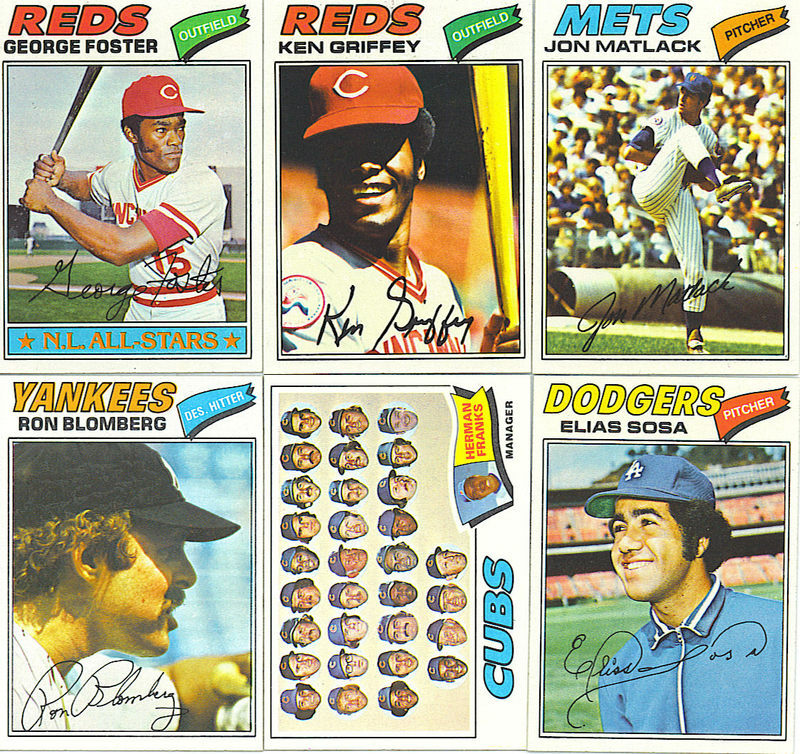 The cards looked great overall and didn’t have as much damage as the cards from the ’78 pack. Overall, it was great ripping through a vintage pack like this, especially when it’s of a set that brings me very fond memories of when I first started collecting. That’s a nice way to start the pack! However, upon closer inspection, the card came out of the pack damaged. There were lots of small creases running vertically on the card, accompanying some sort of sticky residue. Damnit, why couldn’t there be a scrub player on top for this to happen to? Oh well, moving on…. Card 2: #621 Craig Swan (P) – Mets. Swan actually led the NL in ERA in 1978, with an impressive 2.43. Despite starting 28 games that year, he ended up with only 9 victories (man, the Mets must’ve not hit for crap that year). Unfortunately, 1978 was 1 of only 2 seasons in which Swan had a winning record. He spent his entire career (minus 2 games) in a Met uniform and went 59-72, with a 3.74 ERA. Card 3: #161 Bob Boone (C) – Phillies. This was a nice card, despite the awful centering. Bob was the middle of 3 generations of Boone’s in the Majors. He is the son of Ray Boone as well as the father of Aaron “The Bucky Dent of 2003” Boone and Bret “Did he juice or not?” Boone. Bob was a 4-time All-Star and won 7 Gold Gloves. Known more for his defensive skills than his hitting prowess, he spent 10 seasons in Philadelphia, 7 in California as an Angel, and 2 wearing powder blue with the first man in this pack. Card 4: #564 Mick Kelleher (SS-2B) – Cubs. Speaking of players known for defense rather than hitting, here’s Mick Kelleher. Mick spent parts of 11 seasons with St. Louis, Houston, Chicago, and Detroit. In 1,081 career at bats, he had a lifetime .213 average with ZERO home runs and 65 RBI (Come on, even Jason Tyner has that beat!) The card back states that in 1976, his .976 fielding percentage with third best in the Majors. Ironically, he’s shown in his batting stance on the front. WHY?!?? Card 5: #587 John Urrea (P) – Cardinals. Here’s a man who seemed to have a promising start in the bigs. In 1977, he was brought up from AA ball to the Cards bullpen. He was then moved into the starting rotation and won his first 5 starts. He ended up 7-6 with a very respectable 3.16 ERA. A couple seasons later, he was bouncing around between St. Louis and the minors and was eventually out of baseball after 1981. Card 7: #263 Danny Walton (OF-1B) – Astros. Walton spent parts of 9 different seasons in the Majors. In 8 of those 9 seasons, he played in 42 OR FEWER games. The lone exception was 1970, when he went .257, 17, and 66 in 117 games with Milwaukee. It’s never good when one of the highlights on the card states WHEN the player began switch-hitting (1971). I think we have a candidate for Worst Card in the Pack here. Card 8: #628 Ralph Garr (OF) – White Sox. Now getting back to players who were actually productive at one point, here’s Ralph Garr. In 13 seasons, Garr played for the Braves, White Sox, and Angels. His career year came in 1974 while with Atlanta. During this year, he made his lone All-Star appearance and led the league in batting average (.353), hits (214), and triples (17)! Unfortunately, he never regained the magic he had that year and his numbers steadily declined. On this card, we learn that his first career stolen base was that of home plate(!) in 1968. Card 9: #201 1977 Batting Leaders (f/ Dave Parker and Rod Carew): On the back of this card, we see the players who finished in the top 10 in batting average in 1977. There were several teams with multiple representatives here. Rod Carew’s .388 was 50 points higher than anyone else in baseball! The Pirates, Cardinals, Reds, Twins, Orioles, Red Sox, and Royals all had at least 2 players in their league’s top 10 in ’77. This card reminded me of how great a player Lyman Bostock could’ve been if it weren’t for some stupid, senseless violence (and also how great a guy he was). If you don’t know about his story, I recommend you check the link above. Card 10: #149 Dale Murray (P) – Reds. Dale was one of the better firemen of the 1970’s. In 1976, he led the NL in appearances with a whopping 81! In 12 seasons, he played for several teams and appeared in 518 games. He had a career record of 53-50, with a 3.85 ERA. Card 11: #495 Dave Cash (OF) – Expos. Dave Cash played for 12 seasons, all in the NL, with the Pirates, Phillies, Expos, and Padres. He was part of the 1971 World Champion Pittsburgh Pirates. He was also a 3-time All-Star, from 1974-76. Ironically, these were the 3 years he spent with the Phillies. In each of these 3 seasons, he led the league in at bats. He led the league in hits in 1975 (213) and triples in 1976 (12). As a side note, he was once traded for Ken Brett, the brother of the first man from my pack. Aha! Another player with ties to George! Card 12: #165 Rennie Stennett (2B) – Pirates. Like Cash, Stennett also played for the Pirates when they won it all in ’71. At that time, he was one of the youngest players in the league at 20 years old. In 1978, Stennett was coming off a monster previous year in which he hit .336 with 28 steals. His .336 average was second best in the NL (behind only teammate Dave Parker), but an injury limited him to just 116 games. (Note: He wouldn’t have had enough plate appearances to qualify for the batting crown anyway.) He spent 9 seasons in Pittsburgh and 2 in San Francisco. Card 13: #417 Mike Garman (P) – Dodgers. 1978 was Garman’s 9th, and final season in baseball. This card tells us he had a playoff save against the Phillies in ’77. He was only 19 when he debuted with the Red Sox in 1969 and later spent time with the Cardinals, Cubs, Expos, and of course, Dodgers. He ranked in the top 10 in appearances in 1974 and 1975. Card 14: #211 Earl Weaver (MGR) – Orioles. Last but not least, is the Earl of Baltimore. The back of this card displays his entire Minor League Batting Record, which wasn’t exactly impressive. Earl had played in over 1,400 minor league games! I think it’s safe to say he found his niche in managing. As the O’s manger, Weaver’s career record was 1,480-1,060. He led them to 4 pennants and a World Championship in 1970. Earl had an explosive personality, but was one of the game’s best strategists and was eventually enshrined in Cooperstown in 1996. The card features an old photo of Earl during his playing days, as well as one from his managerial days. Not a bad way to end a pack. Final Thoughts: I must say, this pack was a LOT of fun to rip. It was disappointing that the best card in the pack came out damaged, but I tried to not let that (and the massive amount of scrubs) get me down. It was nice to see some Hall of Famers in there as well: one at the beginning, one at the end, and one towards the middle (Leaders – Carew). Considering that the set came out before my parents had even met, I was happy that I recognized as many names as I did and that I wasn’t saying “Who the hell is this?” nearly as much. You gotta love the vintage cards with their more simplistic, yet WAY more effective designs to go along with the throwback uniforms and the (sometimes) funny expressions on players’ faces. This upcoming week, I’ll return you to your regularly scheduled blogging, but I guarantee you this won’t be the last time you see one of these really old-school posts on here.